Anyhow, now its February and even though the thought of Valentine’s clearly divide us, my standpoint is clear: we can never have too many days per year to celebrate love and friendship! Yes, it is a commercial halabaloo but it is also what you make of it. If you enjoy buying gifts or flowers, go for it; otherwise a hug and some encouraging words to those you love is more than enough. Now. I love gifts but I can’t pretend that I purchase them in huge quantities. Being an Expat makes you live far away from a number of your close friends and your family. I’m quite selfish this way: I enjoy treating myself to something small for Valentine’s! Why not? As I’m not a flower kind of girl I prefer to get (and to give) things that lasts a bit longer. 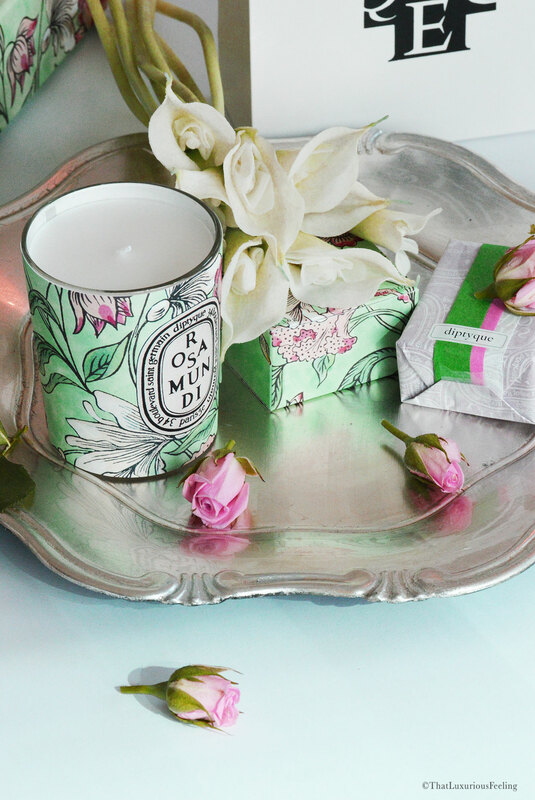 As always, Diptyque has the answer. As a collector of the brand it comes as no surprise that I long for the annual limited edition Valentine’s Day Collection to hit store. Every year the same thing: some interesting version of floral and rose. Artwork that is special and enlightening. Simply put: something rare and exclusive. 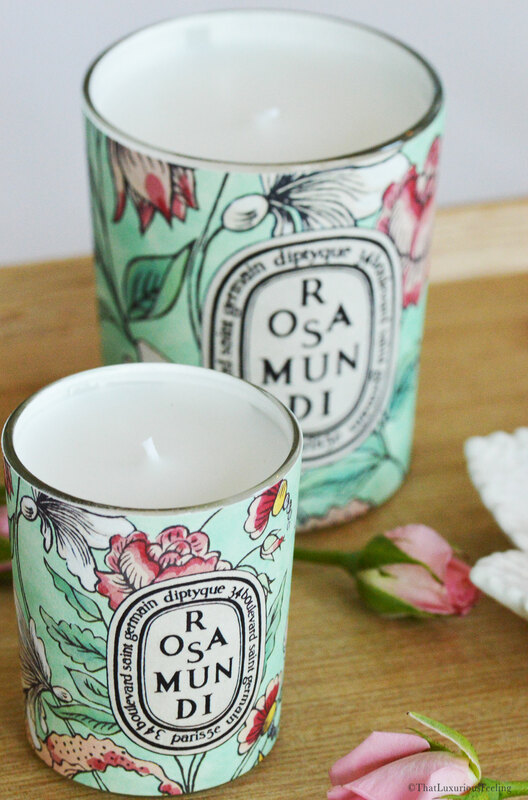 For 2017’s Valentine’s Day Collection Diptyque has just released their ROSAMUNI range. It is a small capsules collection with candles, a solid perfume, a scented oval, something as rare as a box of drawer liners and domino papers. On top of that, a limited edition perfume with multi-purpose. Yes, it is all a bit confusing. Let me walk you trough the collection! First up, the artwork. Diptyque are known for commissioning interesting elements from the art world in order to design their limited edition collections. As a company who once started out making and designing textiles it is lovely to see them honour that heritage. This year, the art is created by Antoinette Poisson. 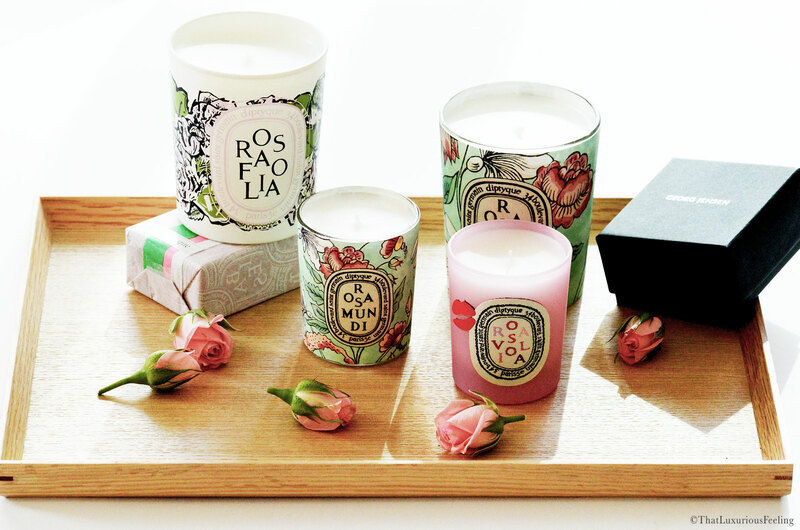 The company is, as well as Diptyque originally were, founded by three artists and restorers. The french interior design company is known for specialising in wallpapers and domino paper. They create and restore patterns, drawn and printed by using the traditional techniques from the 18th century. For the ROSAMUNDI collection, Antoinette Poisson has created two motifs, one floral and one more geometric but both romanic and sweet. The candles are all wrapped up in her floral design. The artwork’s colour schedule thoroughly matches the notes of the whole collection, which is described as floral and rosy with a green undertone. As with all the previous Valentine’s Day collections, rose is the main attention and then follows some interesting twists. ROSAMUNDI features two different roses, the best of their kind: Damask Rose and then Centifolia Rose; also referred to as May Rose. The scent is quite intense and flowery. To tone it down a bit, you’ll also find those fresh green notes as the scent is infused with back currant leaves and bergamot. I must say that this makes all the difference, it allows the scent to feel fresh and young, not powdery like something your grandmother would love! Also in the mix, there is some sweet and fruity notes, mainly Lychee. I would never have thought of adding such an exotic fruit to roses, it works amazingly well. 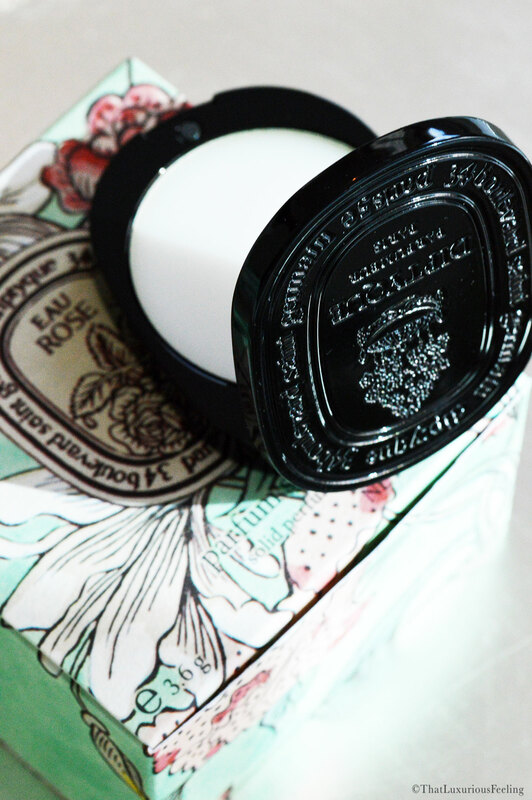 As one of my most worn perfumes ever is Diptyque Eau Rose, obviously this collection really hit the mark with me. It is romantic but grown up, exquisite but still straight forward. Beautiful and elegant. All scents are created out of a story. I think it is important to know that we can’t and should not change history but embrace and take inspiration from what has been, even though we might not agree with or understand certain events. ROSAFOLIA is inspired by and named after Miss Rosamund Clifford. She was the mistress of King of England Henry II and a beautiful lady. She loved roses. However, the King’s wife, Princess Eleanor was insanely jealous of the extramarital affair and so she did what she thought was necessary: she had the mistress killed! King Henry II deeply mourned the loss of his mistress and ordered Damaskus Roses and Centifolia Roses to be decorated upon Rosamund’s grave, every year on the day of their anniversary. This is the tale behind the scent and for the first time ever, I’m owning one of Diptyque’s Solid Perfumes. Obviously, this one is limited edition but there are a number of their most loved fragrances available as solids. I’m very very happy with this one and can’t figure out why I don’t own more of these? That will surely be rectified. Housed on a small, shiny black zamak case it sits there; with its lid featuring the iconic engraved Diptyque Oval. This one comes in a small textile pouch, the pattern designed by Antoinette Poisson and it is simply delicate. So easy to travel with or just carry in your bag for an evening out, you simply rub the scent onto your skin using your fingertips. 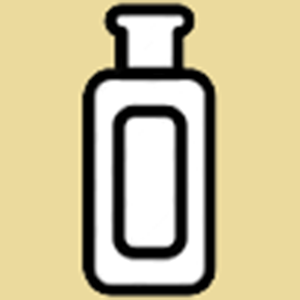 I find that the perfume stays on longer than a regular perfume (even though I often cheat and apply some vaseline onto my skin before spritzing it with a liquid scent for longer lasting power!). Although being a huge lover of the candles, I might actually say that the Solid Perfume is my favourite item from this collection, go figure! As previously mentioned, there is also a box of Drawer Liners delicately created by the artist with a nod to the company’s own range. 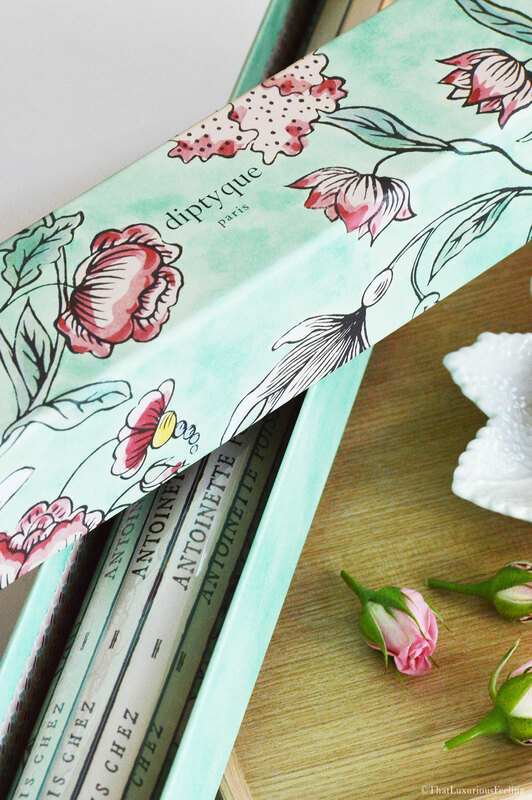 I love the box, the artwork, the scent and the feeling of opening the lid and suddenly being transformed back in time. That’s how I personally feel about it as I’m not someone who uses drawer liners or even potpourri in my wardrobes. I think this particular product is a true collectors item, very rare and artistic. 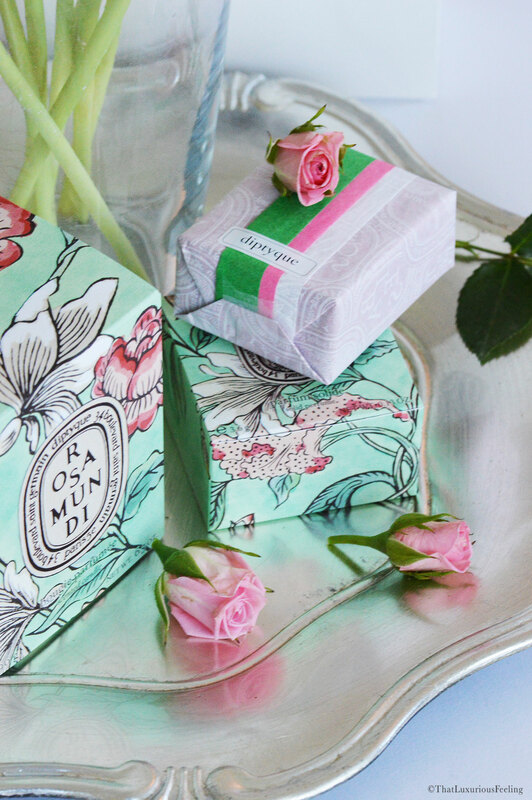 I will find a place for it in my next beauty room, maybe decorating some of the boxes on my vanity. Until then, the box sits on top of my shelf looking fabulous in its own right. It is surely an indulgent piece, maybe not the most practical of gifts but beautifully made. A while back I had the pleasure of interviewing Diptyque CEO Fabienne Mauny (yes yes, I still have to share the piece with you all, I simply need to snap out of my star struck behavior). What she told me then that I hadn’t really thought about before is how much money, effort and time it actually takes to create a limited edition series that still have to hold the same quality in fragrance as the original range. The Nose might be working for a year or more to create a collection that will have a shelf life of maximum a month! Viewing it in that perspective, and knowing that creating fragrances is not an easy task, it makes me feel even more protective of and happy about my limited edition candles and perfumes. I have loved every one of the Valentine’s collection, here you’ll see a part of my private stash. I often purchase duplets; one I can light and another one for collectors purposes. It is nerdy, I know but we are many beauty lovers out there who are doing the same! Very nice review! Hoping to own the solid perfume soon!